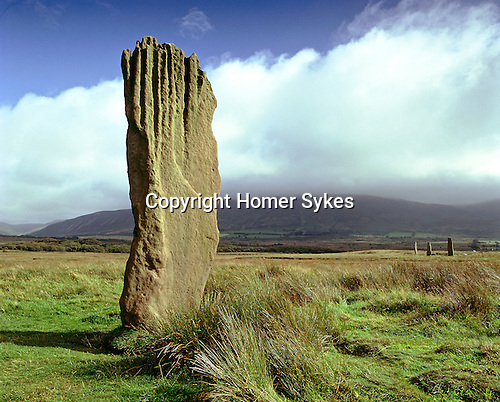 Machrie Moor, Nr Blackwaterfoot, Isle of Arran, North Ayrshire, Scotland. Machrie Moor, Nr Blackwaterfoot, Isle of Arran, North Ayrshire, Scotland. Celtic Britain published by Orion. All that remains of two large stone circles are four huge standing stones on Machrie Moor. Errected during late Neolithic period early Bronze Age. Location: Blackwaterfoot, Isle of Arran, Ayrshire, Scotland.